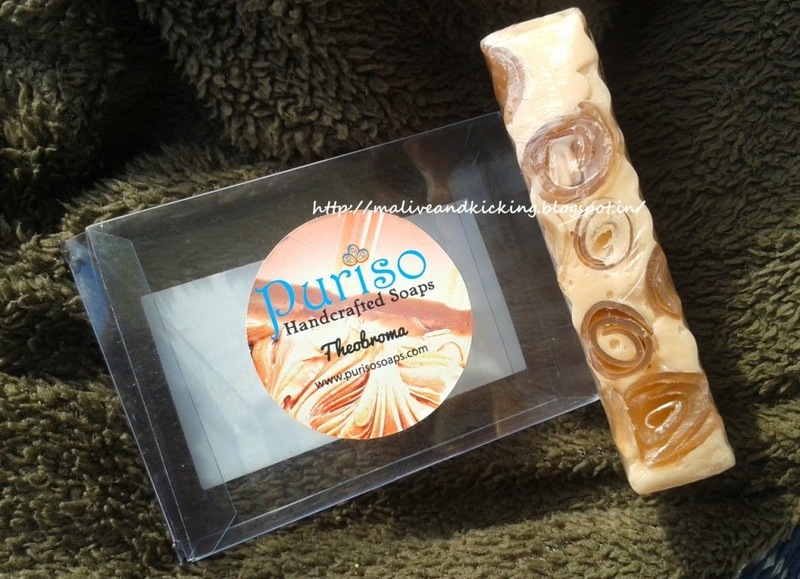 I already shared my thoughts about Puriso Indian Healing Soap here and today's post is about the another handcrafted bathing bar that Puriso sent me i.e Puriso Handcrafted Theobroma Soap. 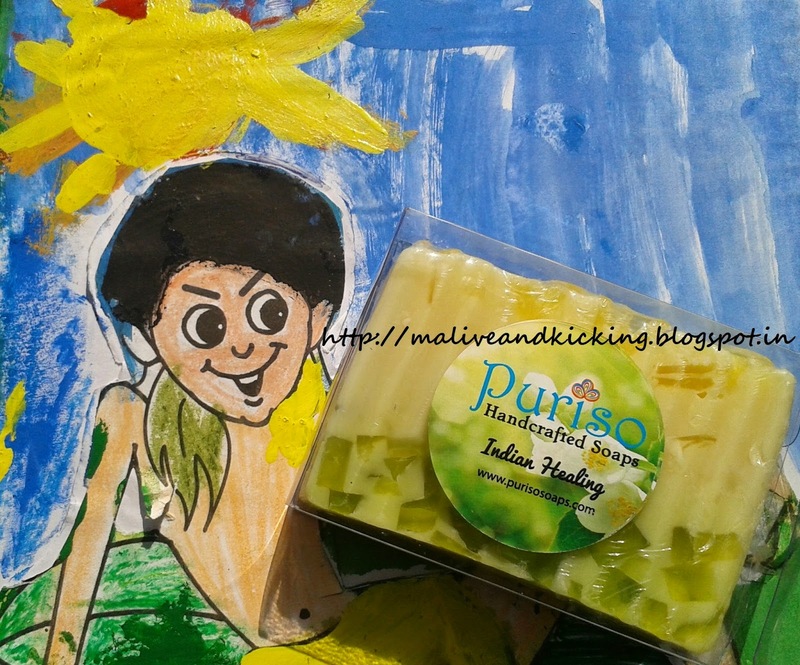 The packaging, price and quantity of almost all the soap bars have been kept uniformly similar by Puriso, and I talked at length about all that in my previous post. (So I won't be repeating everything once again in this post to bore you). 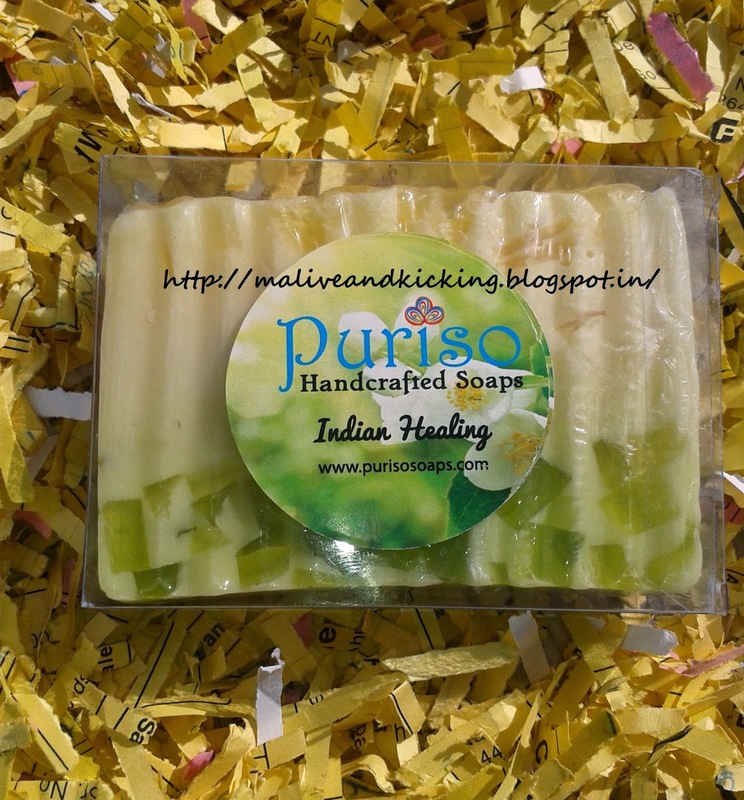 Infact the active ingredients are also in sync with other soap bars other than some essential oils, colors and fragrances. 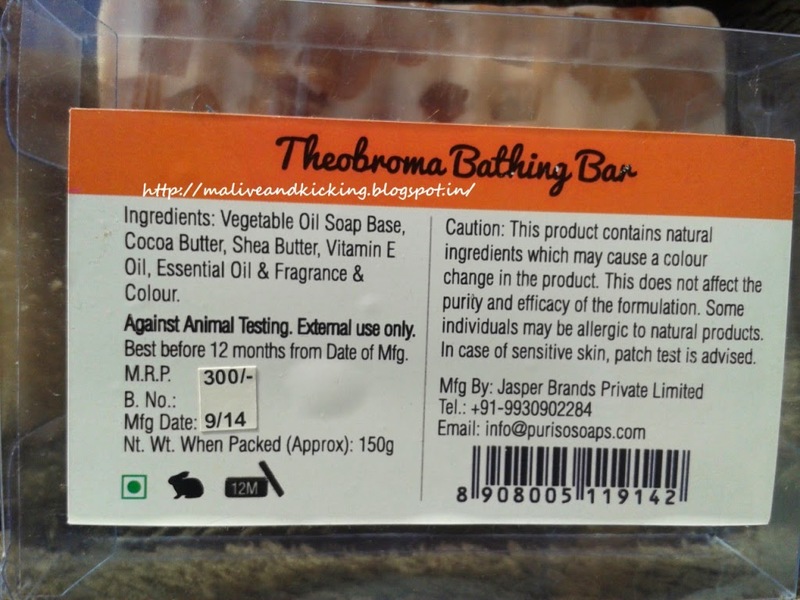 This particular soap bar contains Shea Butter other than Vegetable Oil, Soap Base, Cocoa Butter, Vitamin E oil, Essential Oil, Permissible Color n Fragrance. This soap bar is seriously a feast for the dehydrated skin coz Shea Butter has the properties to nourish skin with super-rich and creamy moisture. My dry skin got instant relief from the effect of harsh wind as I applied a body lotion on damp skin immediately after shower using this soap as it softens and lubricates the skin. The soap doesn't dissolves very quick, so I am expecting one soap bar to last atleast one month or more. The awesome combination of Glycerine content plus Shea butter, Cocoa Butter makes this soap effective with healing properties also. 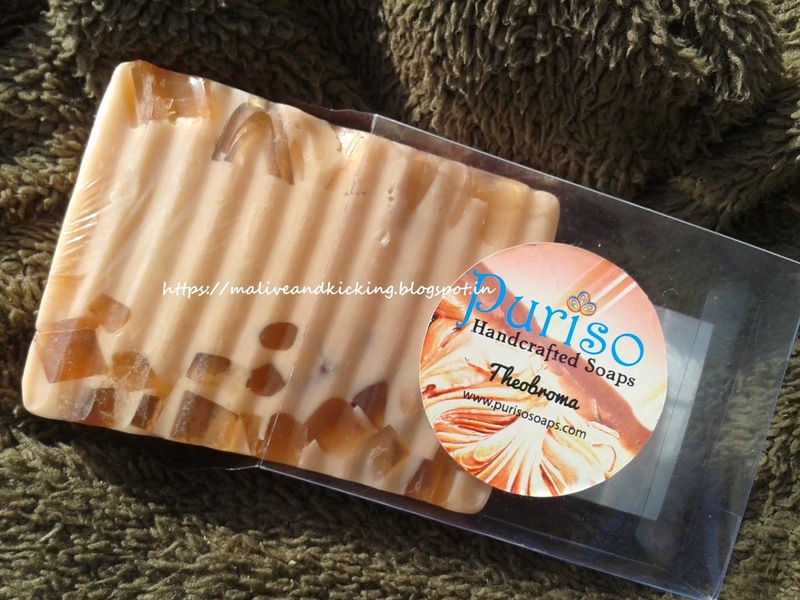 The crux is that the protective and conditioning qualities of Puriso Handcrafted Theobroma Soap make it an excellent choice for all skin types in every weather condition. Try it to believe it!! 'TDH' had been the most frequently used cryptic code that me and my girly gang used to whisper as we see a chic fellow in college ;) Our interpretation of TDH was an attractive TALL, DARK, HANDSOME boys who used to rule over the hearts of girls and be the secret 'turn ons' for most females over there. Even few of the girls had the guts to put their lips together & whistle at those smarty stuff singing loudly 'Chikni Surat Tu Kahan Tha Ab Talak Ye Bataa" and we used to have frequent good hearty laughter at purely delightful incidents :D Then came that geeky personality (sorry, can't name him here) with facial stubble and dark suspicious eyes to our class of under-graduates in the Final Year due to some migration issues.. The tough looking guy in his unshaven face and unkempt hair desperately needed a smooth shave. But somehow this was the most neglected aspect of his personality... Basking in the sun on a sunny winter day in our bunked period in the college, my friend had titled him 'Scarecrow' for his 'not-so-sassy' appearance ;) Other than these masti moments in our class n college, there were definitely serious curricular & co-curricular moments too... and there our Scarecrow proved his mettle. He had amazing ability to cope well with any demanding situation for which we usually needed time for makeup our mind & gather courage. Be it a Subject GD session, Stage Performance, Art or Drama; he mastered every skill with no scope of disapproval. Despite complaining about his unshaven & rough to touch face, all of the classmates including professors were spontaneously flattered to have him listen when he spoke in his commanding accent. Most of the classmates never tried to gel-well with the him and so he spent most of his time in his own type of research on varied assignments within college premises. On the day of bidding adieu to fond collegemates, the manly fellow showed his emotional side in his goodbye message "I don't spend too much time on my appearance, but a toned and muscly guy can be soft and cuddly too if someone tries to look beyond his stubble face. You could have earned a real loyal friend for lifetime if ever tried understanding me rather than fussing over how I looked like. but....." , his voice cracked as we all realized the lump in his throat didn't allow him to continue when he was overcame with emotions. That day changed my entire perspective towards assessing a person's worth which actually never relies on his smooth silky appearance. 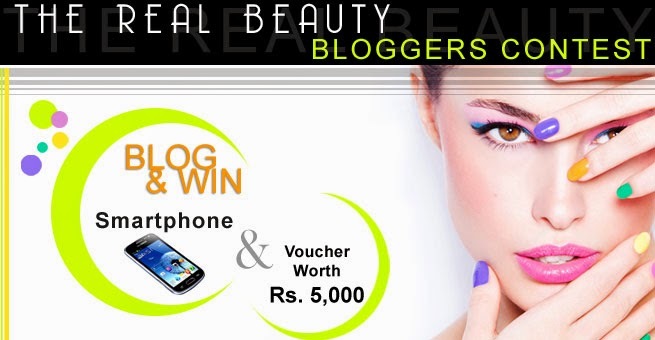 I tag my friends to write for #willYouShave activity - Prerana Ranjan who blogs at Giveaway Dose. We got some really lovely entries donning their makeup like a pro, but there were few more simple rules to follow like following and tagging the pages. We were left with no choice than to disqualify the entries who didn't complete the required steps to be fair to those who followed all the rules carefully. 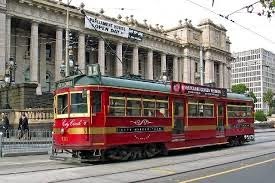 Knowing that delightful Melbourne is titled as World's Most Livable City by the Economist Group, publishers of "The Economist" magazine, I could not resist my temptation to explore some enchanting specialties of Melbourne and loved watching exclusive video clips here. Each of these clips have been a visual treat to my eyes... like this cute one.. The Royal Exhibition Building brought laurels being listed as the first Australian building to be nominated in World Heritage listing which at present is the rarest surviving monument of city and is continues to be used as a general exhibition hall. The gorgeously lively Carlton garden spells the beauty of the building since ages. 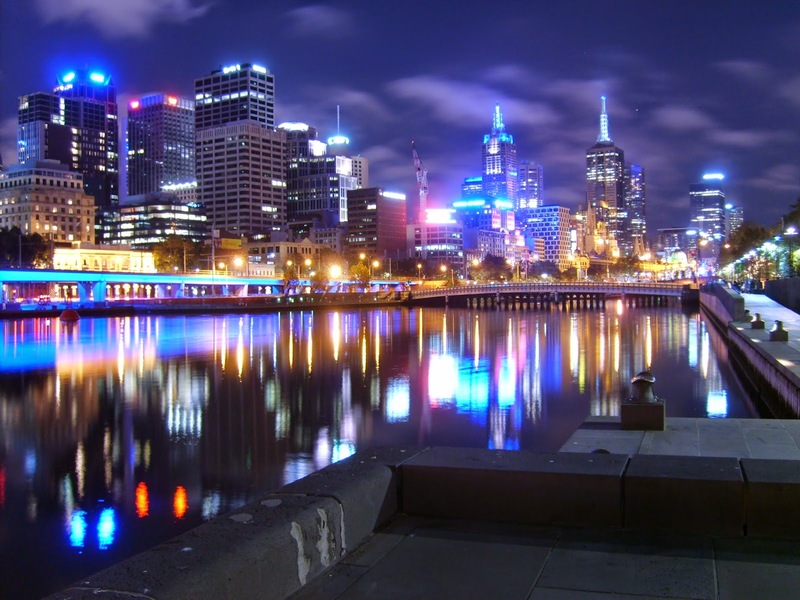 To add up your knowledge of Melbourne extravaganza, here is your comprehensive guide. 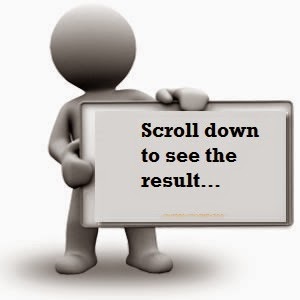 Now, for all my lovely readers who enjoyed reading this post, there is a golden chance to win a voucher of Rs 500 (being given by Indiblogger and Tourism Victoria after the result declaration)just by answering a simple question in comments section below.. 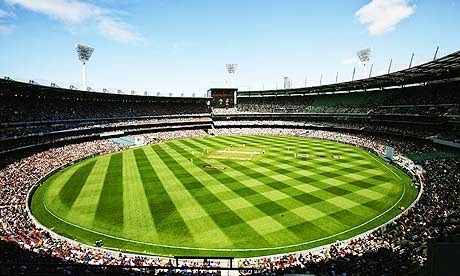 This post is written for Melbourne–The Most Livable City in the World contest by Indiblogger in association with Tourism Victoria. 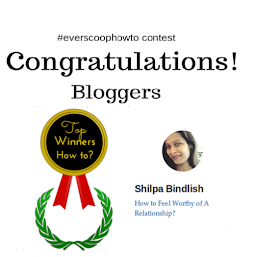 The contest has ended and the winner is Bhawna. Congratulations Bhawna!! 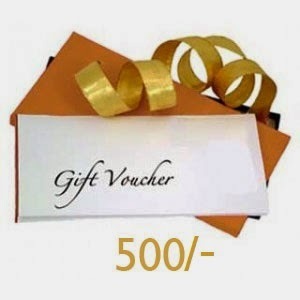 Do message me your email id so that I may forward the same to the sponsors and you may expect your voucher in next few days. Each one of us must have been hearing tales of good old times from parents or grand parents that stressed on practicing Truth in life. But none of us has ever lived our lives without inventing stories to save ourselves from troubles. You may predict a casual, impetuous, n reckless reply "Uff, don't expect us to behave like those profoundly wise sages in these modern times. 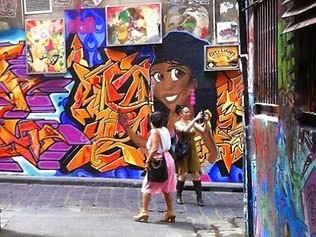 The world around is not same as it used to be centuries ago. 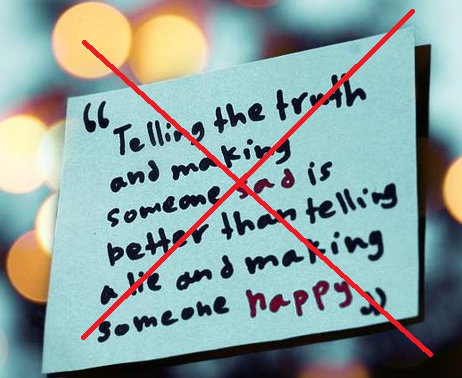 Moreover, its better to tell a lie that can make someone smile instead of speaking the truth that hurts." I am not different from the rest and confess here that I also fabricated the facts once, when found that it may cause me great loss... the loss of love... I was in the midst of the process of convincing my dad to allow me for intercaste matrimony. I had worst of apprehensions in my heart about what could be the possible hurdles in the prospective alliance. The guy who had just started to work didn't earn a heavy pay packet to flaunt and impress my dad and I had heard over and over that the issues arising from financial inequality are simply poisonous in such situations. I cannot tell you how much I wanted him in my life, so exaggerated about position n earnings of my beloved (read hubby now) to dad. Dad didn't even think of inquiring about the fact trust my words completely. For next few days, I was overjoyed of my smart move. But every time I looked at dad's face, I felt guilty of ditching the most special person of my life...My perspective changed with some new thoughts on the matter. I softly apologized to dad unwrapping the hidden reality. 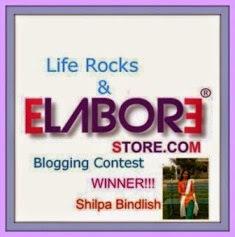 This post has been written for IndiHappyHours activity by Indiblogger in association with Kinley. Human being grow hair almost on all body parts. The hair at some body part are flaunted with pride like on head and the hair growth at other body parts give us tough time to remeeove them like on arms, legs n armpits etc. Most of us are comfortable with our tried n tested hair removal methods like getting them waxed. But don't we want that those hair should remain "gone" for longer time. What if we have some easy-to-use product that affects the rate at which your hair returns. A revolutionary hair-minimizing product that relieves you from getting painful waxing frequently is called "hair-inhibitor". What is Barever exepcted to do? 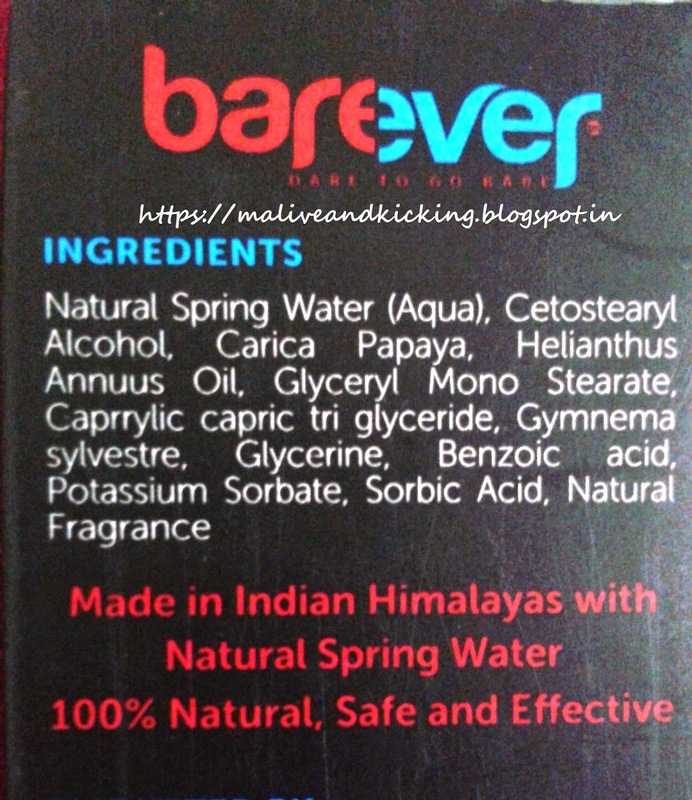 Barever is not a frminine product like most cosmetics available in market, but can be used by men n women both without any restrictions. 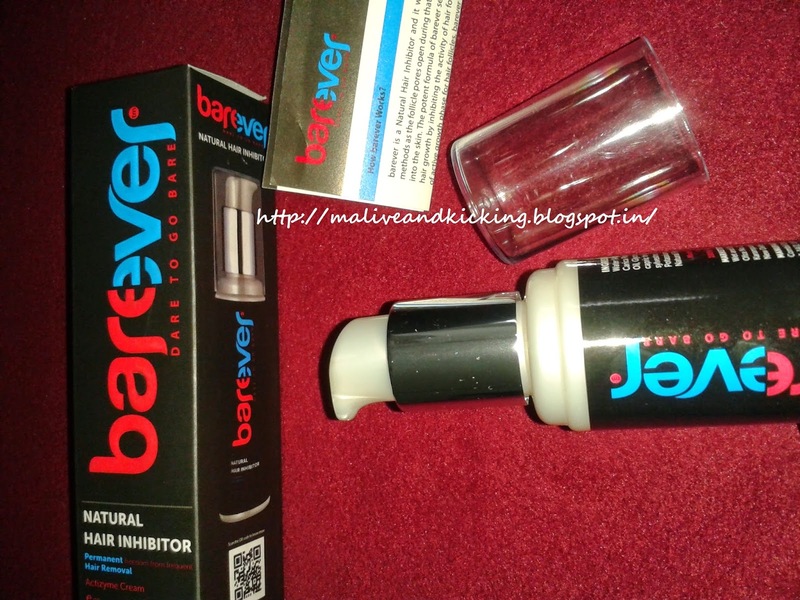 The first impression of Barever has been an impressive one as I read out the ingredients. It claims to be made from Himalayan Spring water & 100% natural ingredients derived from plant extracts which soothe & hydrate the skin. Barever comes in a black cardboard carton that contains the pump bottle with nozzle lock system that can be easily rotated to open n close. The nozzle is covered with a transparent cap. The press-to-extract nozzle pushes out desired quantity of hair remover cream as you push it. There is a detailed instructional pamphlet inside the carton that shows the pics on how to apply it effectively. Remove hair with your regular hair removal method. 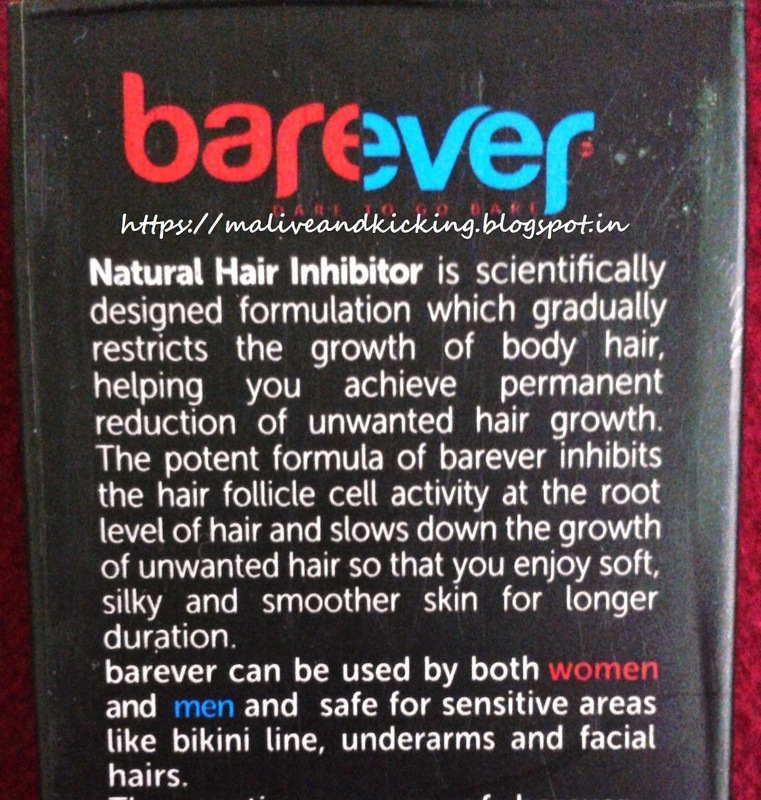 Take enough quantity of Barever and apply on desired area. Massage gently till Barever is well absorbed.Use Twice daily for 5 days after every hair removal session. In case if you used the Hair Removal Cream, use it on daily basis. Barever is priced at Rs 1100 for a quantity of 80 gms that seems on a higher side. But if you compare the reduction is your routine expense of getting the hair removed via wax, shave or depilatory method; the price won't pinch you. I have been using this product since last 25 days. I used it followed by my regular wax sessions for hair removal. Though the product claims to be 100% safe to be used on any body parts including the sensitive areas like lips, eyebrows,chin, bikini line etc., but frankly I am hesitant to apply it on my face. I confidently used it on my arms, legs and underarms area. 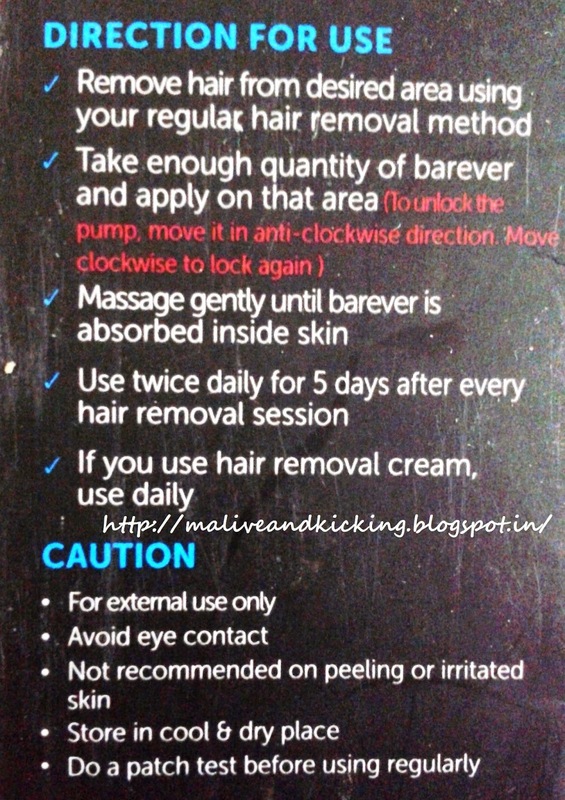 The packing also suggests to use Barever for five continuous days after each hair removal session, but at times I'm damn busy (or may be lazy) to spare even five minutes for that, so what I did was to rub Barever cream atleast 4 days. But the result assures that the continued use of Barever shall surely result into permanent reduction of hair growth setting you free from the life long hair removals ritual. In my clear observation, I noticed that Barever lessens the frequency with which you have to shave. 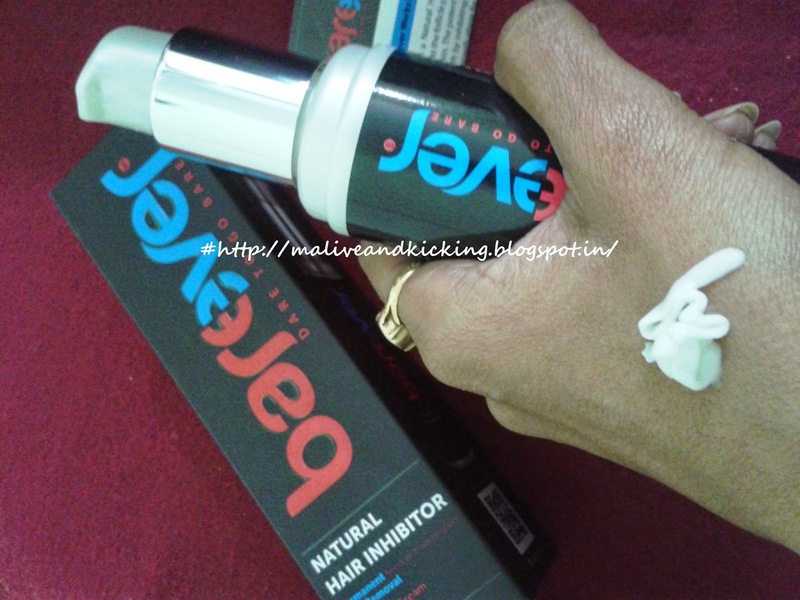 The packaging also reads its reason that Barever is formulated to slow down the formation of new hair at root level and then reduce the density and thickness of hair. The pearly off-white thick Barever cream is easily absorbed into skin as I rubbed it on my skin and it thankfully didn't cause me turn my nose up at some medicinal peculiar smell :/ It didn't contain very pleasant smell but it contains natural fragrance as an ingredients which will not let you reject this product just bcz you hate the intolerable smells. I have given my opinion after two regular sessions in this month, and am still continuing using it for better outcome. Causes no skin darkening after usage. Feels no burning sensation or irritation. Considerably reduces hair removing intervals. Prevent nicks and cuts that usually result due to shaving. Reduction in hair thickness with regular usage. I wish some floral fragrance in Barever to the hair inhibitor cream more of a refreshing one. Price can be a constraint for some. The Barever Hair Inhibitor can complement your hair removal sessions followed by an at-the-home application of this cream to help you achieve silky, hair-free smoother skin longer. Do give it a try and feel the confident!! Let me begin with a note of THANKS for your kind blessings n merriment that u showered on me throughout the last year and never let it fade out. This year also I hope u would listen to my prayers that come packed with my honest wishes in the form of this self-composed poem …. Blessed are these days, when we hear your bells tinkling. Kids excitedly waiting for u, with their bright eyes twinkling. You give not only wonderful gifts to us, but a message to whole-heartedly share. Indeed, I admire all your true love n efforts, That shows how much you care. Just a seed of compassion in my heart to be planted. For their sincere blessings only, I find myself greedy. coz imbibing these virtues in life will certainly let me win. 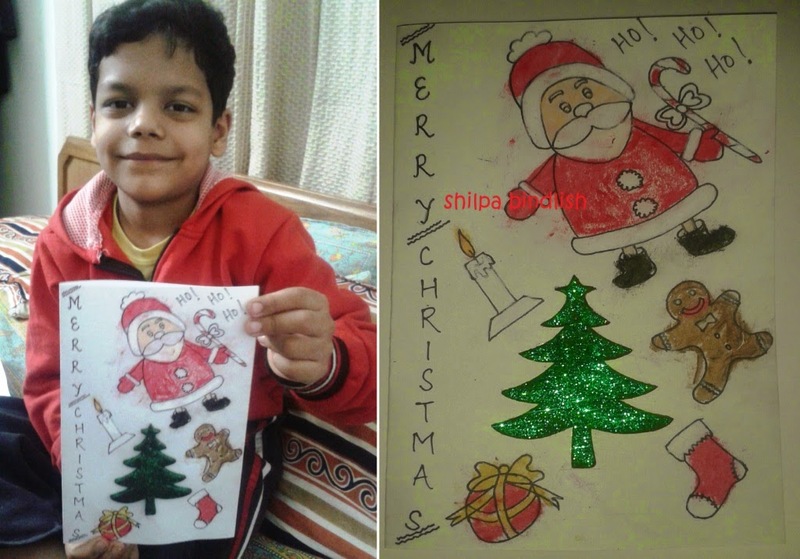 May these gifts of Christmas add joy to my senses. I long for blissful life and no boastful fancies…. The cold winter weather can wreak havoc on your skin. The most common skin issue for many people is the dryness of skin that occurs when our skin doesn't retain sufficient moisture. One of the probable reason of dryness is to use harsh soaps while bathing. I have seen people who tend to switch to liquid body washes / shower gels in place of soap bars assuming those are milder on skin, but thats not always true. The transparent cleansing bar is the gentle way to cleanse, moisturizes, protect and nourish your skin as vizigly+ contains very high percentage of natural moisturizers, humectants and skin softners. Vizigly+, with this optimum concentration and through its unique combination is ideal for dry, delicate skin as it helps to keep your skin soft, supple and hyderted every time you use Vizigly+. Vizigly+ is a transparent bathing bar of pale pink color in an unusual yet very cute droplet kind of shape. 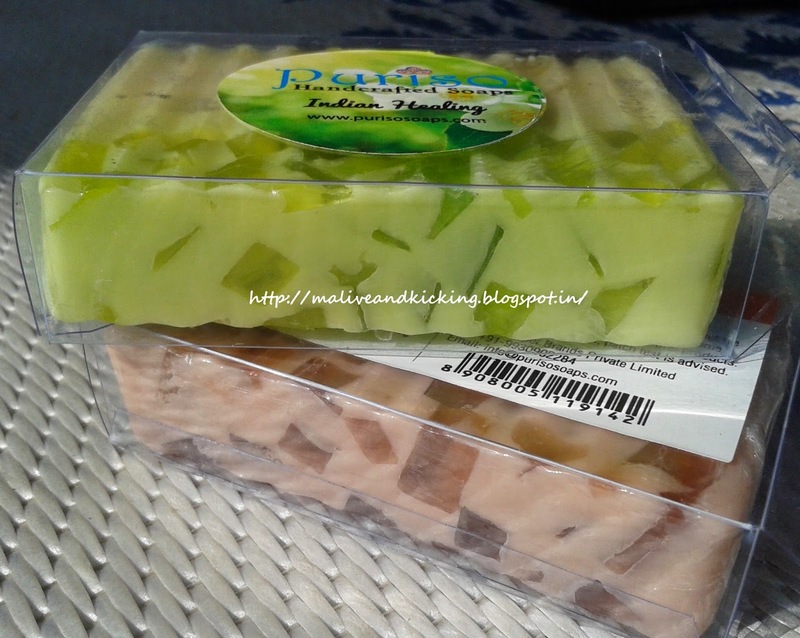 The 100 gm soap bar is just the apt size that you can hold easily in your hand without any need of cutting it into pieces, coz I find holding the bigger soap bars a bit uneasy. The soap bar has a shelf life of 3 yrs and is priced at Rs. 99. How I felt after I used Vizigly+? 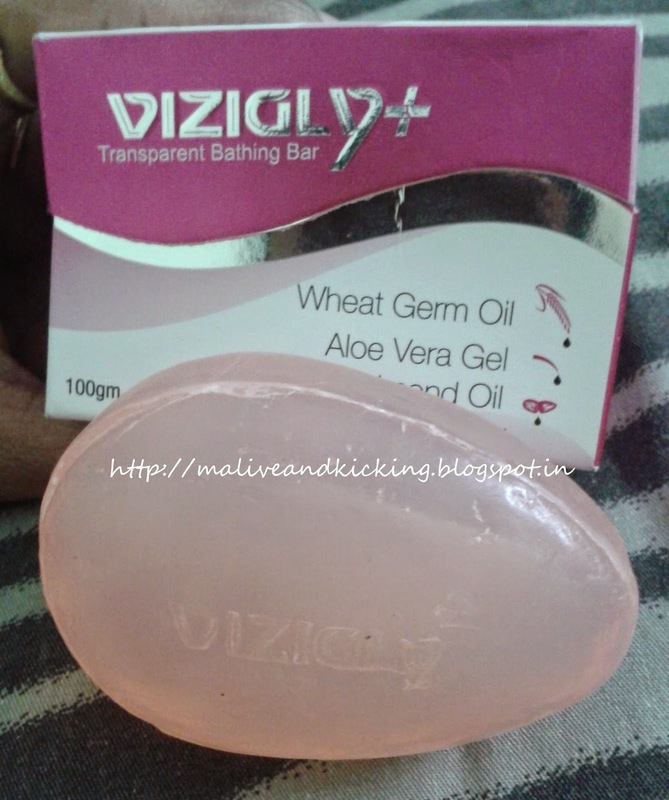 Before I could decide to use this soap bar, I had been thinking not to use it on my face because almost every soap bar causes me excessive flaky dry skin if I apply it on my face. 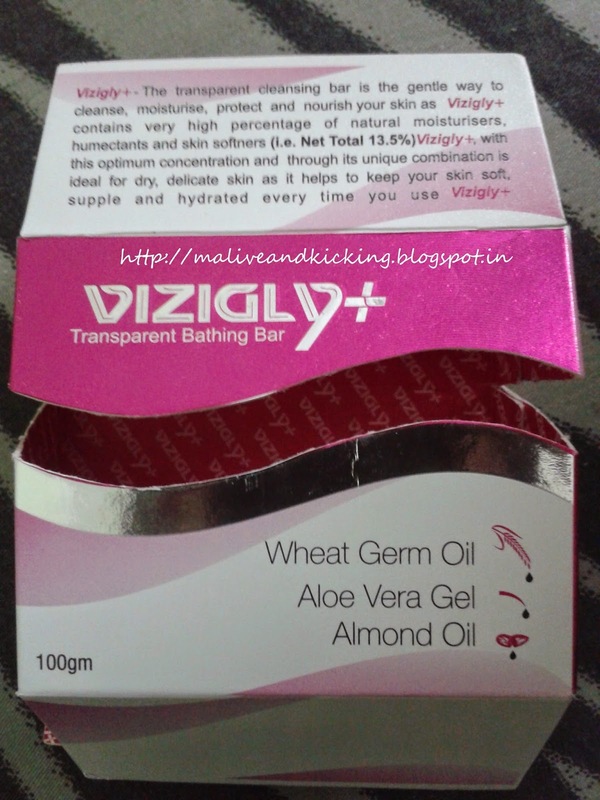 I began with the use of Vizigly+ on body skin for few days continuously. The gentle moisturizing soap felt so pleasing on my skin with instant softness. It produced profuse n creamy lather that got rinsed very very easily. I'm in absolute love with the rejuvenating fragrance of Vizigly+ that stays for quite enough time. 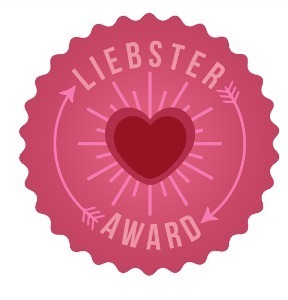 My husband who is always in favour of soaps possessing stronger fragrances approved this soap with a perfect "YES" ;) Though I have no problem of body odor but I'm sure this soap can battle with bad odor efficiently. Actually, the you can let this soap bar scent your entire washroom area with a refreshing feel !! 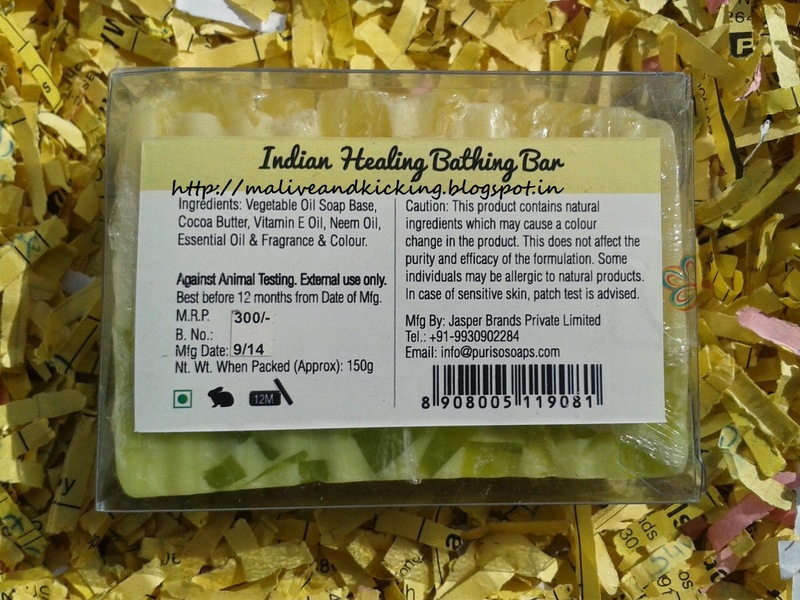 The moisturizing preparations of this soap with key ingredients like Glycerine, Aloe vera, Almond oil and Wheat Germ Oil has the ability to soften and recondition the dehydrated skin. The almond oil included in the soap makes it richer in proteins and extremely nourishing. Wheat Germ Oil supports the skin's natural process of regeneration and also helps repair sun damage to the skin. So the Vizigly+ is a combo pack of multiple characteristics for improving skin conditions. 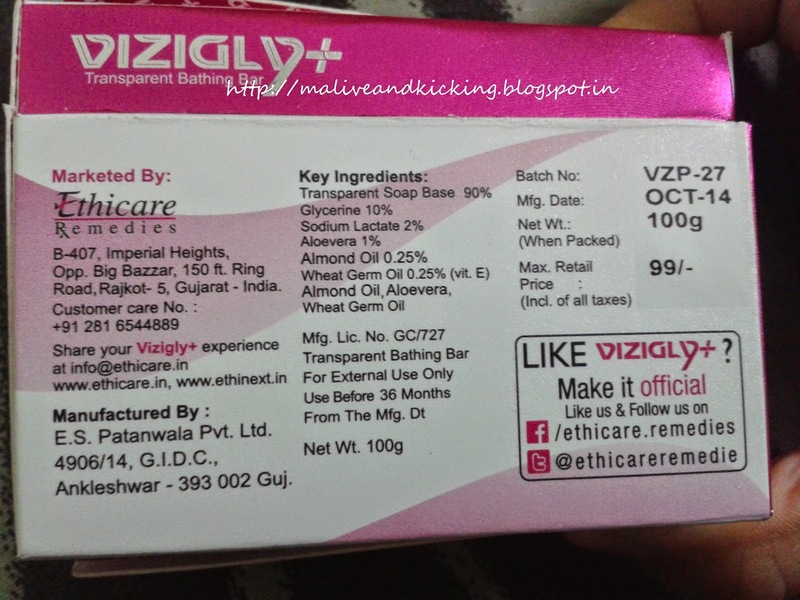 Vizigly+ is one of the luxurious moisturizing soap bar that leaves your skin soft and smooth. 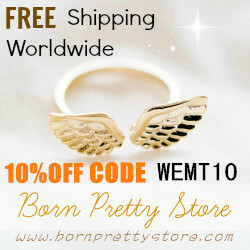 It is suitable to all skin types including dry n sensitive skin. But the people with extreme dry skin can apply a coat of moisturizer post shower or hand wash to plug the spaces between skin cells and seal in the moisture in damp skin. As you use it for your everyday bathing ritual, I bet you would love to enjoy n relax in a lavish bath. Till the next post...See Ya..
Labels: Almond Oil, aloe vera, bath n body, bathing bar, Ethicare Remedies, skin care, soap, transparent, Wheat Germ Oil.